Favorite Bible stories for your favorite toddlers! Noah and the ark, Jonah and the big fish, David and the giant-little readers know which Bible stories are their favorites. The Big Book of Bible Stories for Toddlers is an interactive and engaging new Bible storybook designed just for toddlers. 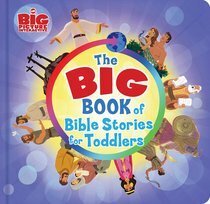 With stories from both the Old and New Testaments, this big book means big fun and learning for little ones. About "The Big Book of Bible Stories For Toddlers"